At The Roof Coating Company, we’re recognized for our ability to restore and repair existing roofs to save clients money. While we believe that roofs are often replaced when there are in fact better options, sometimes a roof replacement is the best choice. When we come by to evaluate your roof, we’ll let you know if a flat roof replacement is necessary. For a free estimate, clients in Hampton, VA can reach us at (757) 244-2305. When Does Your Flat Roof Need Replacing? The right time to replace your flat roof depends on several factors. 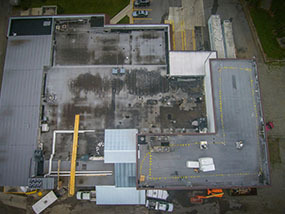 At The Roof Coating Company, our team of experienced roofers know when a roof is capable of being effectively restored. A lot of the time, even a roof that has had several leaks as of late can be set right with a simple roof coating. 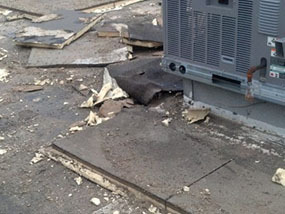 Other times, it just takes the proper company to properly diagnose and repair your roof. In short, a flat roof needs replacing when it’s no longer worth the time and money to repair or restore it. If it’s in such bad condition that you’ll be dealing with leaks regardless, it’s worth saving the headache of constantly repairing it. The Roof Coating Company offers flawless flat roof replacements at competitive prices. The Roof Coating Company works with many varieties of flat roofs, such as EPDM, TPO, and PVC. We’ll be able to lay out the unique advantages of each and help you decide upon the best type of flat roof for your building and budget. A flat roof replacement is a relatively large project but you can rest assured knowing our roofing technicians are professionally-trained, licensed, and insured. At The Roof Coating Company, we only use the best roofing materials. Our flat roofs are effective at making commercial buildings more energy-efficient. As the years go on, the savings on energy costs really start to add up. With over 60 years of combined experience, the team at The Roof Coating Company is ready to provide more high-quality services to clients in Hampton, VA. For a free onsite estimate on a flat roof replacement, give us a call at (757) 244-2305.